I am first-year Ph. 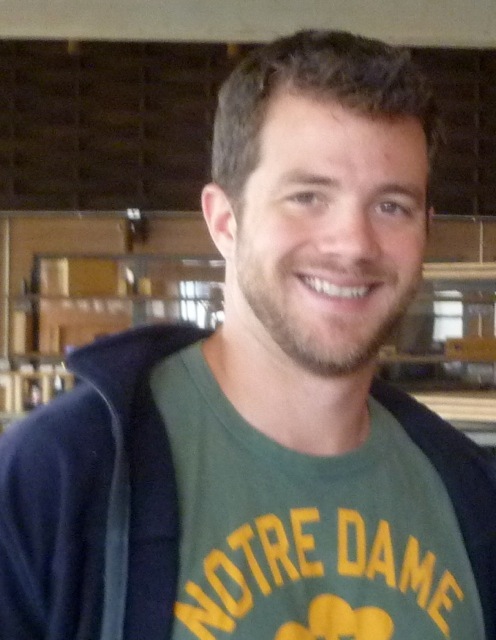 D. student in ND’s Christianity and Judaism in Antiquity program, with a focus on the Hebrew Bible/Old Testament. My particular interest is in divine representation in the Bible and the ancient Near East. I was born and raised in Portland, OR, where I graduated from Portland State University, studying History and minoring in English and Judaic Studies. More importantly, I am getting married this Summer, and I met my fiance here at ND in the Master of Theological Studies program! The SLA Grant to study German will be a major boon for me. As a doctoral student in the Christianity and Judaism in Antiquity program, the study of German is central to my intellectual and academic development. Many journals, articles, critical editions, and monographs continue to be published in German. This is the case especially in areas in which I am interested (e.g. Bible and the ancient Near East). Indeed, no one who wants to engage with the “fathers” of the field or many of its great names can ignore German as a language of study. Furthermore, it is imperative that I be able to engage with German biblical scholars in my career on both written and spoken levels. Being able to attend conferences and lectures conducted in German will greatly broaden my opportunities for intellectual and career development. Through the SLA Grant I will be able to go to GÃ¶ttingen. 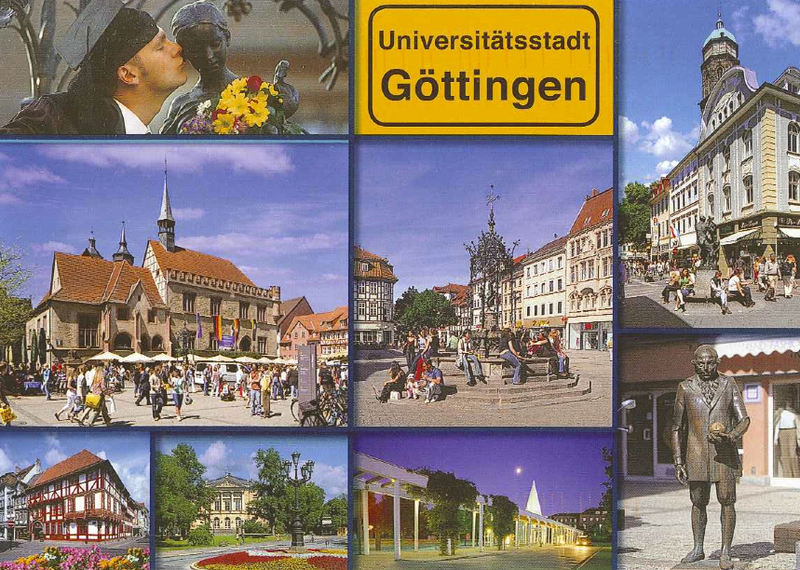 With GÃ¶ttingen’s reputation as a center for theology and biblical studies and excellent library, I am sure make connections with German-speaking academics in my field. My primary need in studying German is to learn to read it with greater fluency. Such a goal is not divorced, however, from interaction with the living language and living culture whose language it is. Thus I hope to take my current ability to communicate in German (both writing and speaking) and improve it such that I can (1) have a conversation comfortably (even without understanding everything) and write fairly simple letters or emails without frequent recourse to a dictionary. More than anything, my goal is to immerse myself in the language so that I become comfortable using it on a frequent basis in my research. By the end of the summer, I will be able to more easily communicate with German biblical scholars on topics related to my field. 2. By the end of the summer, I will be able to read scholarly material (i.e. articles, books, etc.) with much less help from dictionaries. 3. By the end of the summer, I will be able to speak, read, write, and listen at level at least one semester beyond my current ability. Given that a big key to language acquisition is immersion, it will be of primary importance to avoid interaction in English wherever possible. This begins with a basic commitment to using German even when speaking with my peers in class who may know English. I hope to stay with a host-family. This would seem to be the most promising in terms of facilitation of language use, and is the outlet I will pursue most actively. There are other ways I intend to facilitate my language learning. There is an elderly care facility I hope to volunteer at, simply speaking with residents (who I assume likely to enjoy patiently allowing me a chance to practice my own German, and in addition may be willing to share some of their own stories or local lore with me). Should this prove unfeasible, the university of GÃ¶ttingen has a rec/sports center, Hochschulsport, which offers inexpensive memberships to the public. Here, I would involve myself in basketball games etc. whenever possible, which would provide another avenue for interaction in the language. Finally, the Goethe-Insitut provides several means (excursions, sports program, tours) outside of class to engage local culture and language. After looking back at my first week (out of four) here in Goettingen, I can say that the pace of my learning has increased. To begin with, though I have recently studied German grammar and have had to read articles etc. somewhat regularly in the language, I have not used the spoken language for a few years. So while I was placed in a particular level appropriate to my knowledge of the language, it has taken a few days to catch up to the speaking/listening ease of the rest of my class. I recognized the issue fairly early on, and have made sure to pay extra attention during conversation, realizing that using a second language never comes with the ease of the first! This has payed off. Today, for instance, I was able to speak with (patient) locals and communicate somewhat comfortably. We discussed what it is I study and what it is I’m interested in, along with where the others had studied etc. This would not have happened a week ago when I arrived. Also, sometimes this week I have had to write down a fair number of words that the instructor has used so that I can look them up later, while everyone else apparently is already familiar with the word. The process of learning new words has sped up. But so far I have had to keep a running entry of words to try and memorize so as to make the rest of my learning experience smoother. Stay tuned to see whether this pays off! One expectation that I had which has been proved false is that many Germans here would prefer to speak English with me. But fewer know English well here than I supposed. The positive result is that I have been forced to speak more and with increasing clarity. Likewise, it allows me that much more of an opportunity to hear the language in its living context. In spite of my difficulty using the language, locals are nonetheless respectful, answering me as if I had said everything properly and granting me the same greetings/farewells as they would any other. I have observed, though, that while I can usually express myself well-enough (i.e. to communicate basically what I am trying to say), I still have frequent difficulty understanding what I hear. That is, sometimes a sentence may pass by, and though I may know every word/form in the sentence, this sense of the phrase may escape me unless I am given time to put it all together. I suppose the solution is simply more practice listening. The past week has brought with it several new experiences and reflections on my facility in German. This past Monday I joined a tour group from the Institute on a guided tour around Goettingen, given in German. This allowed me a longer exposer to natively-spoken German than normal (the pace in class is naturally somewhat slower). This tour (along with other similar situations) have made me aware of a recurring experience: it often takes a few minutes to get accustomed to someone’s speech before being able to understand the speaker better. That is, after the first few minutes of the tour, my comprehension increased significantly. That is not to say I caught everything–or even half of what out guide said. But it does suggest, I think, that simply being used to how the words are pronounced by a given individual makes a world of difference. Of course, there are times when some individuals simply speak more clearly than others. I was able to have a conversation with the priest after last-weeks mass, for instance, whereas I could not understand the homily particularly well yesterday. This has impressed upon me the need to speak with many different people, so as to become accustomed to a wider range of speaking habits. Regarding the relationship to in-class/out-of-class experience, I have noticed with pleasure that I have begun to use more complex forms instinctively outside of class. I’ve experienced this particularly with the polite forms of questions (i.e. “could you please tell me where/how” etc.) which have their own particular set of rules. Having appropriated these rules into a usable form (i.e. beyond just reading/hearing comprehension) has been a positive experience. It gives me confidence that with practice and repetition, one need not even think consciously about the particular forms being used. With that said, I plan this coming week to actively employ new grammar with frequency outside of class (e.g. in conversation with classmates, in town etc.). Looking back at my last journal entry, it seems worth reflecting on a few items. First, I have continued to be able to use more and more comfortably those forms/rules that I have learned in class. This has come as a result by simply taking the risk of saying something stupid (not that I wold recognize every time that I did). My travel by train yesterday was a good time to put this into practice. I missed my connection, and had to figure out how to get where I needed to go. Being able to explain what it was I needed comfortably made this a far easier and less stressful event than it might have otherwise been. Secondly, gaining confidence by the day in the language, I’ve grown likewise more comfortable striking up (simple) conversations with strangers. I had the pleasant experience of explaining to a barista at a McDonalds (the only place open where I could locate some caffeine) what exactly a “red eye” was and why I needed it. So he made me a drink he’d never made anyone else before. With respect to the journaling tasks, I have managed so far to discuss slang words with a number of people of different ages. I chose to ask about “geil,” “bock,” and “spinnen” (crazy) They are primarily used by the young, and I am told that one ought to be careful regarding the context in which especially “geil” (= “awesome”) is used, as it could mistakenly express the same sentiment as “Ich bin heiss.” I have hence avoided the word. Likewise, it was interesting to hear about how the US is received in popular culture. Given that this is an election year, American politics are a somewhat frequent topic of conversation. I was told that the impression (at least in Goettingen) of American politics is somewhat negative, though far more receptive to the American Left than the Right, as more is held in common with the Left. Finally, the only particularly local festival so far as I could understand is one that centers around events and performances in the main city square by the Ganzeliesel fountain and elsewhere in the old city, called the “Goettinger Nacht der Kultur” (Goettingen Night of Culture). Sadly I will miss it (this coming Friday). It is not a holiday in its own right, but simply a celebration for the city. With but a week left, I have much to make of the short remaining time. I will focus particularly on moving a bit more slowly in my reading and speaking. It has proven helpful to take my time, even when it feels painfully slow. In the end I am able to read with better comprehension and speak much more clearly (and properly). I made good progress the last week of studies. The lessons doubled back to things learned at the beginning and also covered new ground as well. One of the things covered which I had been exposed to before but never totally comfortable were the passive sentences in the present, perfect an preterite tenses. Having covered these again in class along with the practice of these forms in class made recognizing their use in reading far easier. With respect to cultural experiences, I had a brief conversation with a young man during a soccer game (on TV) about his perception of the USA. He had, in fact, lived in Indiana during high school for a year as part of an exchange program. His experience of living here in the States had been a very positive one, and he was able to make many friends. So it was interesting comparing his first-hand experience of the USA to those with only second-hand (i.e. through media) experience, as his reaction was generally more positive. In any case, I was told several times independently during my last days in Goettingen­ that my spoken German had improved dramatically. I was able to hear and understand and speak with much more ease than that which I had begun with. This tells me also that going to Germany “awoke” as it were all the spoken German I’d learned in the past in college, and that it had never really gone away which was a fear of mine. Finally, though I had struggled greatly in comparison to my classmates in the beginning of the month with the hearing-understanding tests, by the end I was right on par. So the time in class and outside of class in the community must have made a great deal of difference. It has been just under two weeks since I have returned from Germany, and I have come away with a few reflections. First, in the few opportunities I’ve had to test my German since returning (a few emails, reading a few sentences here and there in the footnotes of articles) I have found myself significantly more comfortable than before. Looking back at my stated goals, I realize that I have met those related to basic correspondence in the language for my field of study. Likewise, I have certainly moved a semester beyond my previous level of German. I think this came about because I was able to integrate my previous knowledge of spoken German with my working knowledge of grammar. That is, the class was both speaking/hearing and grammar heavy, and this worked, I think, in my favor. This also came about because I was able to immerse myself in the language, both at the institute and in the community. My primary plans for getting involved in the local community did not pan out, but I intentionally involved myself in the local community as much as possible, interacting with people regularly at church, the library, the local university, and community events sponsored by the institute on site. So the immersion process remained successful. Finally, I was able to take advantage of being in Germany to visit an important museum in my field of study on my way home: the Pergamon in Berlin. This museum has an excellent ancient Near East collection which includes the Babylonian Ishtar Gate from the time of Nebuchadnezzar II. Having had a month of German (plus my previous experience) was very useful, as not all of the information about the exhibits was in in English. Having better access to the language made the visit all the more worthwhile for my scholarly development. Having had some time now to reflect on my language learning in Germany, I’ve come to understand better the results that can come from near-total immersion in an environment. Even when speaking with other non-native speakers in the target language, my acquisition improved, as I was given that many more opportunities to practice using new grammar and vocabulary. Likewise, now having had the chance to apply my new skills to my studies, I have had success with respect to my articulated goals. Reading was the primary goal, and this has very notably improved. Also, when I was abroad before coming home I had to the chance to correspond via email, and so my writing has likewise improved. Finally, from the beginning of the course–when I had much trouble listening and speaking, to the end–when conversation became somewhat comfortable, I noticed drastic improvement. With respect to engaging the culture, I feel I was able to successfully understand and adapt myself to the cultural differences. Though, to be sure, we generally had much in common. Before the summer, I did not really have any sense of all the information that I could or would absorb in the next month. But by mid-month and especially at the end, having made friends (using the target language) and navigated the landscape and culture somewhat, I realized how much I had retained and what a difference immersion had made. I don’t think I could have expected that. Advice-wise I would suggest to anyone going abroad that they try and forsake their own language as much as possible while abroad. Furthermore, with all sensible respectfulness, do not be afraid to ask strangers questions or strike up conversations. I think this is particularly true of Germany: the average person was not going to approach me and start a conversation, but they were perfectly willing to be troubled by a respectful auslander (foreigner). Maintenance of my new skills should not be a problem on the reading front, as I should have plenty of opportunity (and necessity) to employ the language. That is, I cannot get around having to use the language in my field (and am having to use it currently; in fact, when I finish this reflection I have a book to finish reading). There are other students I know of who have learned the language with whom I can converse to keep up on my speaking–though this is, to be sure, a tougher task. Besides the hard skills I have acquired, the success of the grant is that I should be able to appreciate better (if imperfectly) what a whole swath of scholars writing in German contribute to the field(s) we share.